Whatever in hell that means! A decade ago, during a visit to the Bay Area in California with a colleague, one of the alumni we met sort of floated this invitation to join him and his family on a weekend trip to Vegas. Vegas! The mere thought of the bright lights made my glands ooze with hormones! 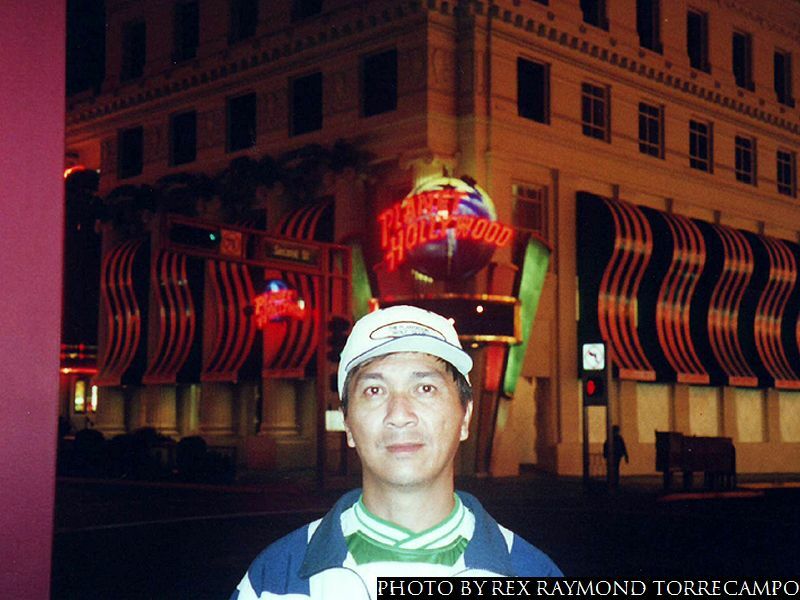 However, one of the kababayans working in the school where we stayed probably felt sorry for the two of us Fobs – fresh-off-the-boat, which technically probably did not apply to us because we were not immigrants – and invited us to an all-expenses paid trip to Reno. That was – like – the next best thing to Vegas, so who were we to refuse? Do not ask me why because I just plain do not know. It was not as though he was a kamag-anak or something. In fact, we did not even know he existed before we set foot on the school we were visiting. Maybe he just had a golden heart. Or maybe he just wanted to spend time with a couple of authentic kababayans fresh from the homeland… Whatever his motives were – and because we were Peso-earners on a tight budget – we could not very obviously allow the opportunity to pass. 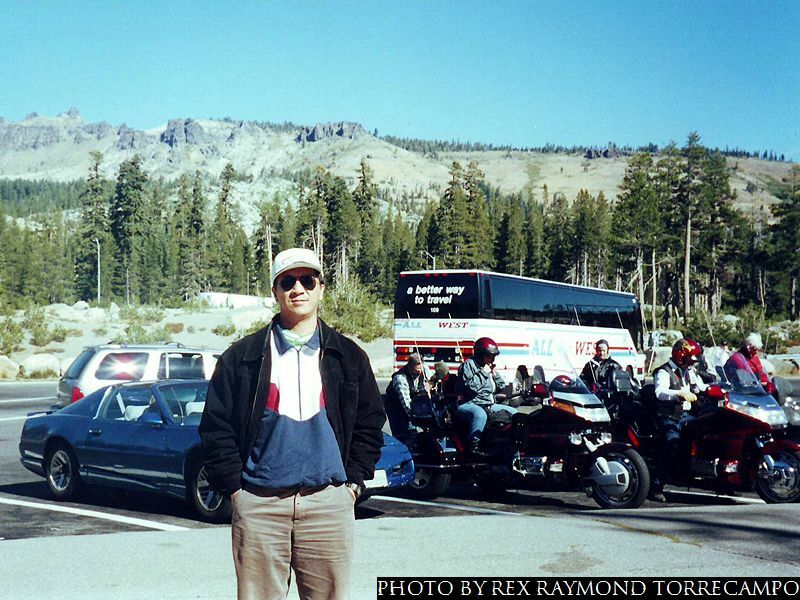 So, our host picked up his girlfriend one weekend and the four of us drove from our base in Northern California up to the mountains of Nevada, passing vast wheat and corn plantations and forests of evergreen along the way. Up in the mountains, we encountered a troop of bikers soaking in the sights and sceneries that the bright autumn morning had on show for anybody who cared to look. It was pretty! 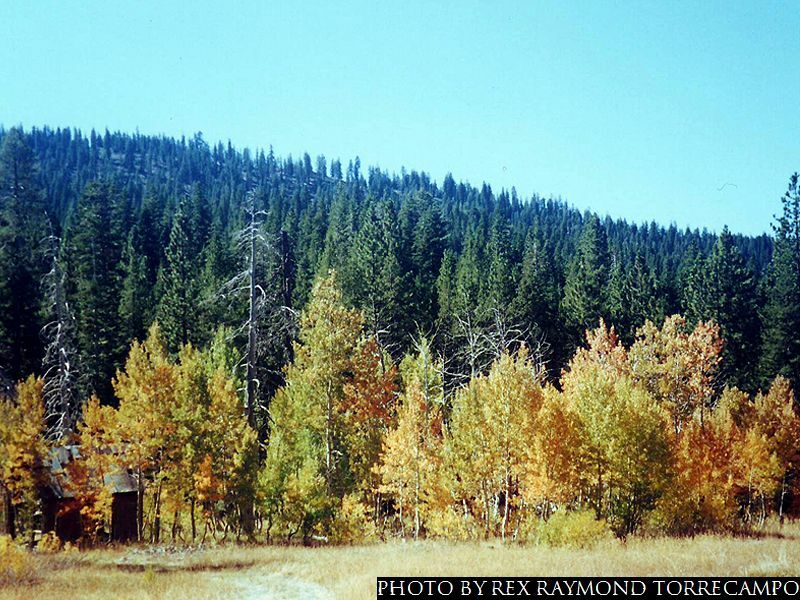 Aside from the evergreens, there were also forests of trees whose leaves had turned to gold. 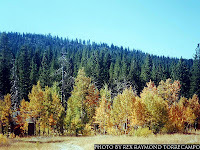 Days away – I supposed – from falling onto the ground so that the trees to which they belonged could strip themselves of foliage in preparation for the icy months of winter. I had to ask for a stop so I could take a few photographs to take back to my tropical home as tangible memories. The changing terrain forewarned us that we were approaching the state of Nevada. The lush flora of the mountains started to give way to the barrenness of the desert. 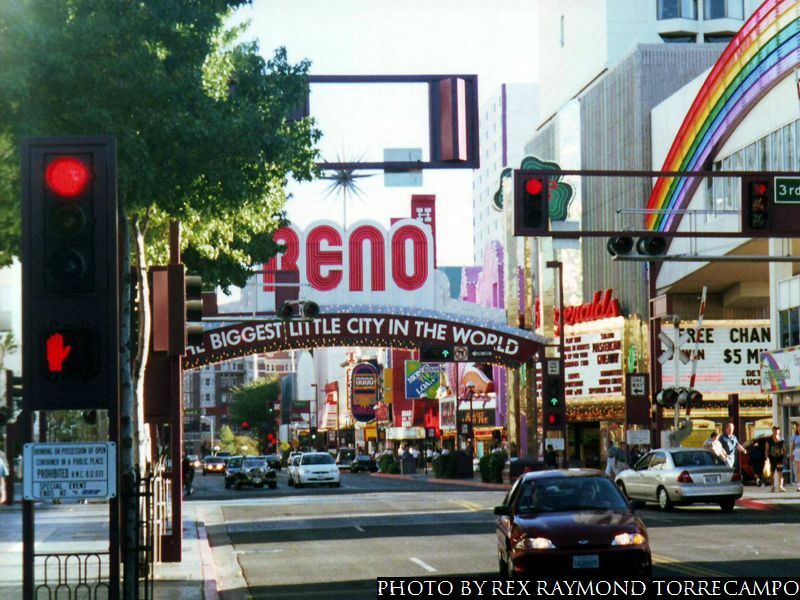 Before long, we had arrived at the Biggest Little City in the World: Reno! Our timing was perfect! We arrived just as dusk had started to set in; and the multicolored lights started to appear as though fireflies dancing to celebrate the arrival of the night. Our host and his girlfriend checked themselves into the Hilton; and were thoughtful enough to book us in a hotel downtown where, they told us, we could enjoy more of the dancing lights. Naturally, once my colleague and I were by ourselves, we set out to explore the town. If not for the fact that the town was filled with weekend tourists like ourselves, I would have called our stroll along the brightly lit avenues parang tanga. I mean, it was like, pose in front of a hotel’s neon signage, take snapshots; walk a few yards to the next hotel, take more snapshots. We went on and on. The lights were intoxicating! Tiring, too! But hey, if in case I had not said so before, I was born under the sign of Taurus. I do like outdoor exercise; but I like rest just as much. My colleague, as it turned out, went out to explore some more long after I had bedded in for the night. 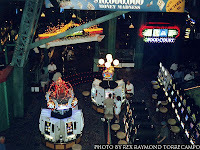 The next day, we walked the casinos. Our host played; we watched. 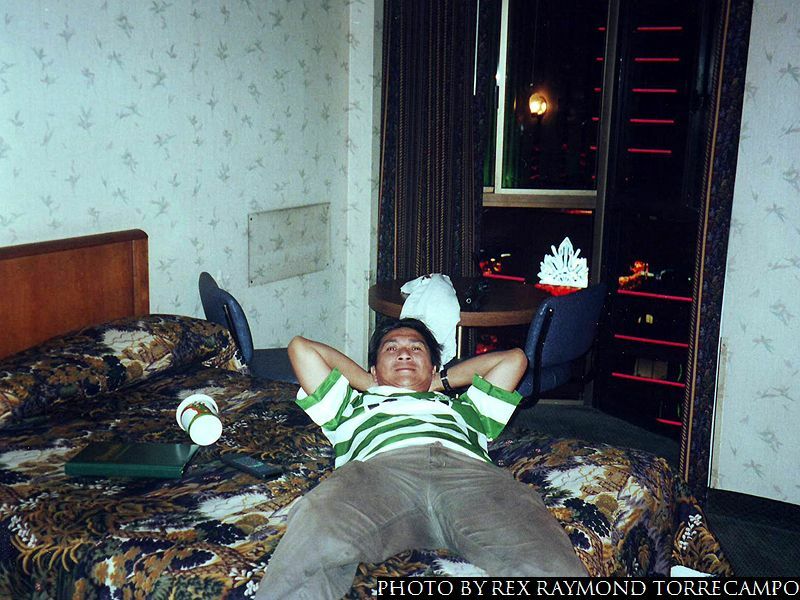 We must have looked tu-ong kaawâ-awâ, so at one point, he even tried to hand us dollar bills so we could begin to enjoy ourselves gambling in the casinos if just for fun. We both politely declined. The gesture was appreciated; but we would have looked tu-ong kaawâ-awâ ngâ! I mean, when we were by ourselves, my colleague and I would joke about who would foot the hotel bill. 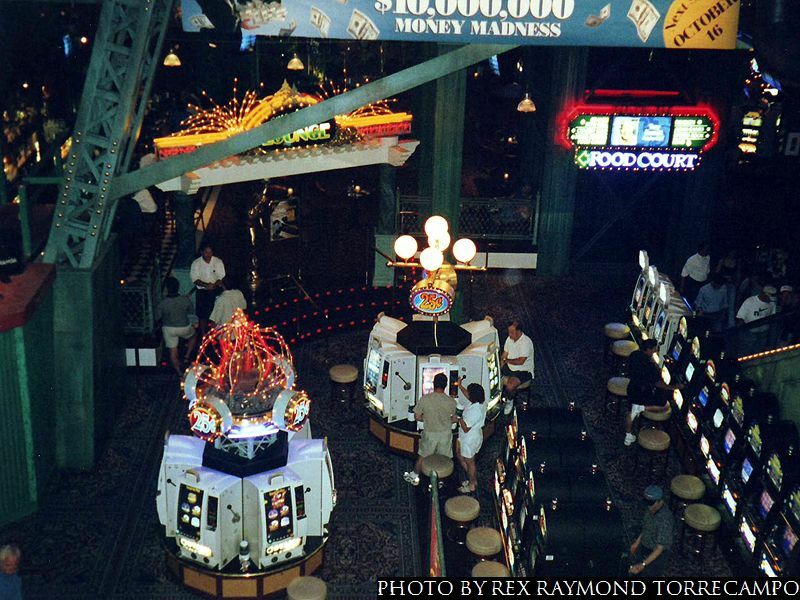 We heaved silent sighs of relief when our host picked up the bill at the end of our brief stay; and I say this just to illustrate how foolhardy it would have been to play the baccarat tables or even just the slot machines. Ah-ah… Mahirap-hirap languyin ang dagat Pacifico! It was not all gambling, though. We were treated to a song-and-dance revue, all the while sipping fabulous piña coladas like casino habitués. Balâ-balâ lang… At times, it was also a little too much to take in all at the same time. 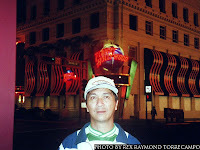 There was one other thing I found remarkable about Reno: kadaming kababayan. I dunno… The brown skin can mean any of a number of Asian nationalities. Yet, when you come face to face with a Pinoy in a foreign land, you just sort of know it is a kabayan. Mostly, the ones we talked to were serving cards on the tables. They replied to you if you tried to engage them in conversation. But they were also always careful not to get too friendly lest the eyes watching the security cameras started to think they were up to something fishy. Ah, well… The Biggest Little City in the World… Probably appropriate because the city is not very large. I suppose the “biggest” refers to the dreams it nurtures in the minds of those who come visit; or the lives destroyed of the multitudes who inevitably fail. Not for me, though. The gambling, that is… More than 600M na ngâ ang lotto, but I am just not the gambling type. I like to think that I prefer to hold my destiny in my own hands. 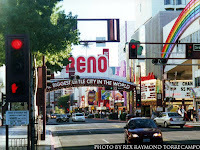 I would not mind returning to Reno, though, if just to look at the bright lights again!